The first of a three-part series reviewing the history of apartment housing in Greensboro. As a county seat and college town during the nineteenth century, Greensboro saw little need historically for multi-family apartments. That began to change as the city attained great wealth through insurance, chemicals, and textiles, growing to become the fourth largest city in the state by 1940. 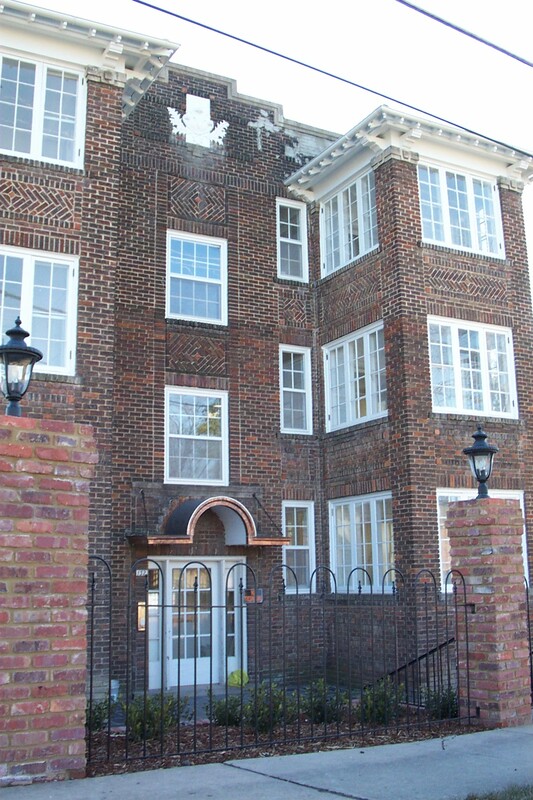 Part I is a review of Greensboro’s earliest initiatives in apartment housing through 1920. High density housing was quite rare in early Greensboro. Density was relegated to boarding houses and large residences containing extended families. In 1900, the historic Bumpass-Troy House in College Hill housed an extended family of nine, including seven children between 27 and 12 years of age, and the homeowner’s sister. On Washington Street the same year, Martha Ridge managed a house of eleven, including three of her teenaged children and seven male boarders between the ages of 30 and 20. Nearby, Lula and Emery Stafford had a ten-person household in 1900, comprised of six children between the ages of 13 and six months in addition to a son-in-law and a servant. Many who owned large Victorian houses in the established sections of town took boarders. Most boarders were male – as young women typically remained at home while young men sought entry-level positions on their own. As industry and service jobs increased in the city in the first decades of the twentieth century, housing accommodations grew scarce. Alternatives to single-family residences were first introduced as components of mixed-use developments. 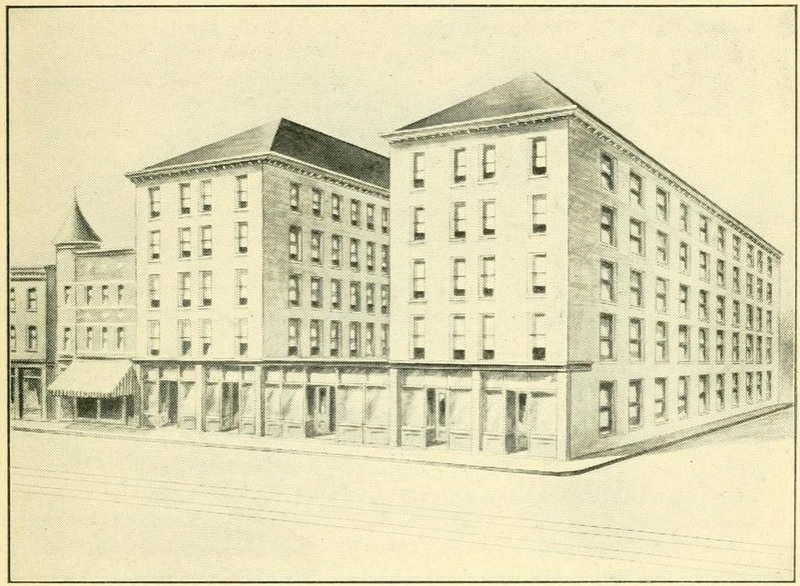 When the Southern Loan and Trust Company constructed their five-story headquarters in 1899, the top two floors were finished as “sleeping apartments.” Demand for office space required conversion of the apartments to offices within a few years. This building has been destroyed. In 1905, the Benbow Arcade (image, right) was opened by Charles D. Benbow on South Elm Street as a mix of office and hotel uses. By 1912 the hotel was operated as long-term rental as the local press reported the “upper two floors are given to single sleeping apartments and rooms en suite.” The Arcade was later replaced by the Meyers Department Store. Within a year, C. W. Jennings Apartment House (image, right) announced a mixed-use building on West Market Street designed by architect Richard Gambier. Newspaper reports in 1907 stated “the three upper floors will be arranged for the accommodation of families, and on the ground floor a café will be operated. 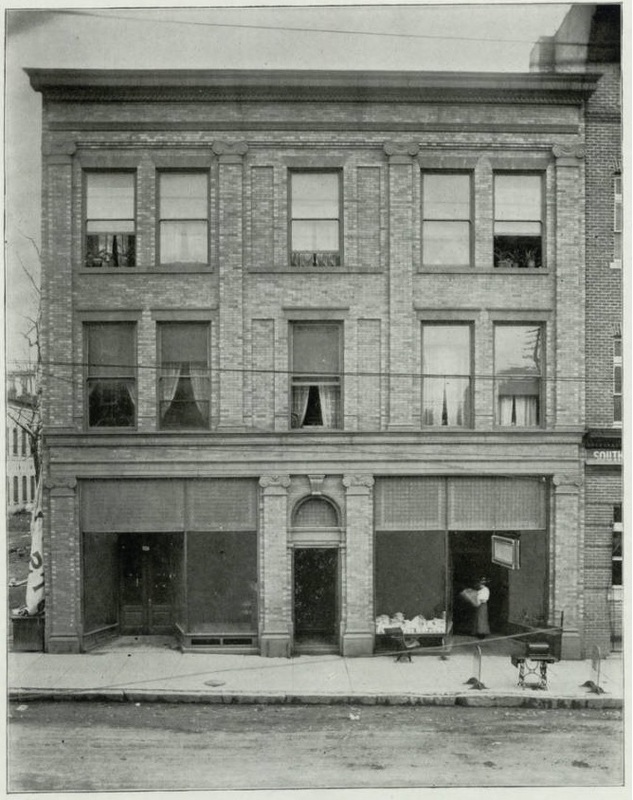 This café will be conducted on the European plan, and, while it is intended for the benefit of those having apartments in the building, it will be open to the public.” The building had just four suites that were rented ahead of completion in 1908. It was noted for being “the first building of the kind in Greensboro.” The Jennings Apartment House was destroyed for parking in the 1970s. Plans for an apartment house on West Sycamore were scuttled in 1913, but in the same year Scott Reynolds built the Scott Apartment House on Fayetteville Street. The structure featured twelve apartments, each suite containing a living room, dining room, kitchen, pantry, two bed rooms, bath, closet, and hall. Rental was $32.50 to $40 per month. According the Greensboro Daily News “Another similar building on the northside of town, in the opinion of those who ought to know, would be one of the best-paying investments that a local capitalist could make.” The Scott Apartments no longer stand. In 1919, plans were announced for the construction of a modern apartment building at 132 East Fisher Avenue constructed by the Vick Chemical Company, makers of Vaporub. Completed in 1920, the Vick Apartments apartment building featured Mediterranean influences such as a corbelled cornice, low-pitched hipped rooflines of flat green tiles, and an elaborate cast-concrete foliated medallion inscribed with the letter “V.” The $40,000 building was designed by architect Albert C. Wirth to accommodate six residences. Contractors Lanning and Coe erected the three-story brick building featuring generous floor plans, each unit with a sunporch, living and dining rooms, kitchen and bath, hardwood floors, and brass fixtures. Upon completion residents enjoyed the conveniences of steam vapor heat, an incinerator, and a locked room in the basement for storage. Although it was initially anticipated to accommodate Vick employees, earliest occupants included architect J. B. Crawford, contractor R. S. Sawyer, and George R. Dawson, the secretary to the president of Vick Chemical Company. The apartment house stands as perhaps the earliest purpose-built multi-family residential structure in the city. The building solved a housing crisis in the years after World War I that was felt in demand for moderate income units. As companies experienced challenges in attracting skilled talent due to lack of housing, the Vick Chemical took this progressive step to provide accommodation for staff. The building was restored in 2004 and is recognized today as a Guilford County Landmark Property. With the economic prosperity of the Roaring 20s, Greensboro’s apartment boom saw a succession of apartment projects that grew larger and more luxurious. By the end of the decade, Greensboro witnessed the construction of apartments that were among the very best in the state, in terms of architecture and amenities.